Offering three solutions in one easy-to-use package, the Xyron 4400 Professional Cold Process Laminator makes large document and poster finishing fast and easy. They Xyron 4400 instantly applies matte or gloss laminates, adhesives or both without heat. The width is adjustable to accommodate 38" and 42" documents. Large input tray with alignment markers and adjustable edge guide aid in document feeding. The patented supplies allow users to quickly and easily change between applications. They Xyron 4400 is the one machine for all your large document finishing needs. The Xyron Pro 4400 is your complete professional document finishing system. Instantly applies laminate, adhesive or both without heat. Perfect for posters, displays, mock-ups, banners, signs and other large-format output. Document Thickness: Up To 3/16"
The Xyron 4400 is designed to apply high quality adhesive or laminate to posters, banners and any other visuals up to 42 inches wide and up to 300 feet long. The machine and supplies are compatible with all types of computer printed media including laser, ink jet, colour and thermo in a wide range of material sizes. The control panel for the Xyron 4400 is located on the right hand side of the machine. The Xyron 4400 can only be operated with the 'power' button has been pressed and the indicator lamp is lit. To turn the machine off, press the 'power' button again and the indicator light will turn off. The emergency stop button will immediately stop the machine. To release the emergency stop, twist it clockwise. 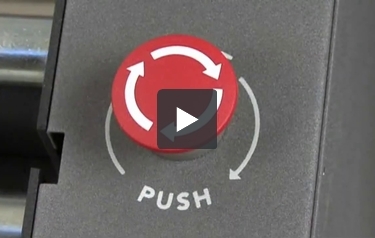 The emergency stop button will override all other switches including the 'on-off' switch. The 'forward-reverse' switch changes the motor direction. During normal operation, the machine should always be switched to 'forward' mode. The main reason for using the reverse setting would be to remove and install roller material. The 'auto foot' switch changes the motor control modes. Auto mode allows the motor to run constantly. Foot mode allows you to start and stop the machine by pressing and releasing the foot pedal, allowing for greater control. For troubleshooting tips, refer to your user guide. Remove the feed tray from the machine. Carefully cut the film from the top roll using the upper idler bar as a blade guide, taking great care not to cut the rubber roller. Slide the top roller out of the machine. 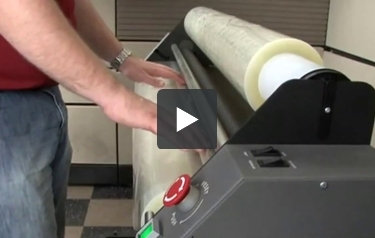 Put the machine in reverse and remove the film from the bottom roller. Slide the bottom roll out of the machine. For trouble shooting tips, refer to your user guide. Transcript: Before starting the loading process, remove the tray from the machine. Match the colour dots on the end of the supply roll with the corresponding dots on the side of the machine. Note which roll is identified as top and bottom. The bottom roll has a starter section. Before starting the loading process, remove the tray from the machine. Match the colour dots on the end of the supply roll with the corresponding dots on the side of the machine. Note which roll is identified as top and bottom. The bottom roll has a starter section. Slide the supply roll into the grooves in the sides of the machine, making certain that the roll is inserted completely. On the bottom supply roll, grasp the starter section by the leading edge, route over the bottom idler bar adjacent to the lower rubber roller. Make sure the starter film is inserted squarely between the two rubber rollers. Refer to the Web Path Diagram to see an example of this. Pay special attention to the machine rollers, idler bars and supply roll locations. Use the foot pedal to run the starter section into the rubber rollers. Ensure that the film is exiting beneath the cutter bar assembly. Advance approximately half of the starter section. Be sure not to run any film with adhesive exposed into the rollers. Grasp the film from the upper supply roll and adhere to the adhesive on the lower supply roll. By carefully aligning the edges, keeping the film tight and avoiding wrinkles, film waste will be minimised. Use the foot pedal to run the film through the machine. Ensure that the film is exiting beneath the cutter bar assembly. Run material through the machine until all the wrinkles go away. The amount of material used with vary depending on accuracy. Trim of excess film by using the hand held cutter and sliding it in either direction. After the film has been loaded, replace the feed tray and you are ready to begin using the machine. For troubleshooting tips, refer to your user guide. Dealing with large documents can be challenging, so when you need to work with them, having a high-quality device can really make your job go more smoothly. If you need to laminate such a document, one option available is the Xyron 4400 Wide-Format Cold Process Laminator. This is a machine that does its job admirably but it does have a few weaknesses you need to know about. To find out what they are, please keep on reading. The 4400 is a large-format machine that is good for processing large items including mock-ups, posters, and so on. It can laminate and apply adhesives to objects that are up to 3/16" thick and 35, 38, and 43 inches wide. And if you need to work with a very long document, the 4400 can handle it because it will process an item up to 300 feet long, depending on how much film or adhesive is left on the roll you're using. You can use both glossy and matte laminating film with the 4400 so you can choose the right look for your item. The 4400 can also apply adhesive to your large documents using special roll sets made by Xyron. These sets can apply adhesive to one side of the item using either repositionable or high-tack adhesive. There is even a roll set that will laminate one side of your item will making the back sticky, providing you with a durable document that can be stuck just about anywhere. This product has a set of heavy-duty rollers that consistently apply just the right amount of pressure so your documents will look great. When you use this machine for lamination, your document won't suffer from imperfections such as wrinkles and burns (flaws that often result for hot lamination), while adhesive will be spread to every inch of your document for the best hold possible. The 4400 has an integrated trimmer for the easy trimming of excess laminate. The films and adhesives Xyron makes are environmentally friendly so you can have a clean conscience about your impact on the planet when using this device. 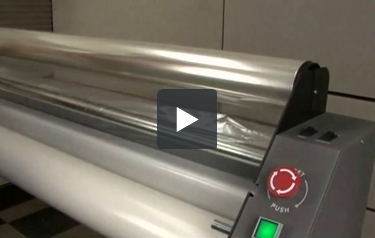 Unlike most of the laminators that Xyron manufactures, the 4400 needs electricity to operate. And despite this machine's need for power, it cannot perform hot lamination, so an additional device will be needed if you want that capability. This is an extremely large machine that's over 4 feet long and almost 2 feet wide, plus it weighs almost 200 pounds. The 4400 will definitely take up a large amount of room, and due to the stand not having wheels, it will probably be difficult to transport. Another weakness of the 4400 is that you can really only use film and adhesive that's been manufactured by Xyron. Although the roll sets that the company makes are high-quality, there isn't much in the way of specialty laminating films. Also, if you try to use film that has a paper backing on it, you may run into some trouble because the 4400 lacks the take-up roller found in most cold laminators. You could possibly remove the paper backing yourself as you laminate, but that could get a little be unwieldy. As you can see, the Xyron 4400 laminator has its shares of both good things and bad. Although this machine works great and has a number of capabilities, it's possible that those strengths could be overshadowed by the device's drawbacks, especially the price. However, if you're comfortable with the machine's quirks, this could be a great laminator to have around.